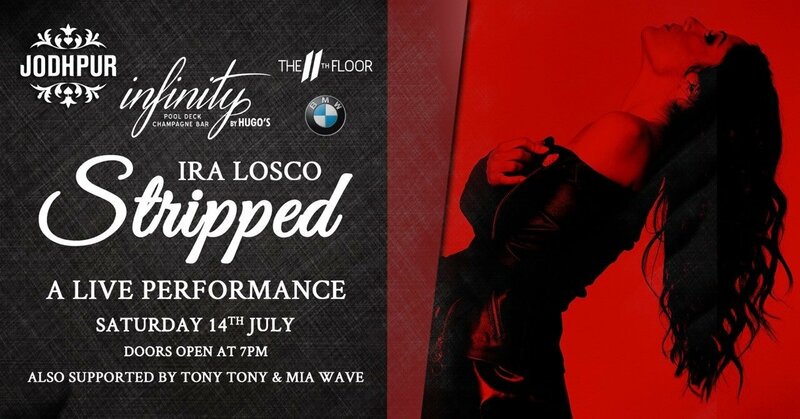 Ira Losco, THE biggest name on the local music scene, will be performing LIVE at Infinity by Hugo’s on Saturday 14th July. This intimate performance with her band will also feature Dj’s Tony Tony & Mia Wave, along with personalized signing of her brand new album. Don’t miss this fantastic opportunity to watch Ira at Malta’s most lucrative venue this Summer!! Get your tickets NOW by logging on to http://www.ticketline.com.mt/bookings/Shows.aspx?ProductionId=533 . ‘Stripped’ is also brought to you by Jodhpur Gin, BMW and the 11th Floor promotions.